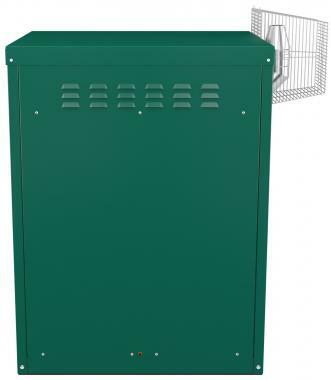 The Enviroblue Combi-Pac External 20kW Oil Boiler is a highly dependable condensing floor standing unit manufactured by Firebird. This boiler comes with a high efficiency rating of 93%. An output of 20kW makes it perfect for smaller homes with just the one bathroom and not such a high demand for heating or hot water. This unit is also available in a range of outputs from 20-35kW so you can be sure there’s a unit in this range to suit your home’s demands. As a Combi boiler, this unit supplies hot water and heating on demand by using the mains water supply so you don't need to have bulky cylinders and they’re designed to be placed outside, which both help to save space in your home. It comes with a variety of features and benefits including a galvanised PVC coated casing that’s weatherproof help protect your unit whatever the weather. This boiler has a high performance Riello RDB blue flame technology. This boiler is fully insulated helping to prevent any heat lost. It comes with a fitted frost protection stat. Helping to keep your boiler protected through the cold wintry months when you need it most. This unit is ultra quiet in operation and comes with a patented heat exchanger design. With all these features allowing for a highly reliable and efficient unit that you can be sure is not going to let you down. In the unlikely event of an issue, this boiler has a full diagnostic control box, so you can trust that you’ll be able to find the fault with ease. This boiler comes with 5 years warranty which means you’ll be getting peace of mind with your new boiler.